So besides jogging slowly, I spent my time in Vegas learning how to gamble. I’ve never really gambled in my life. 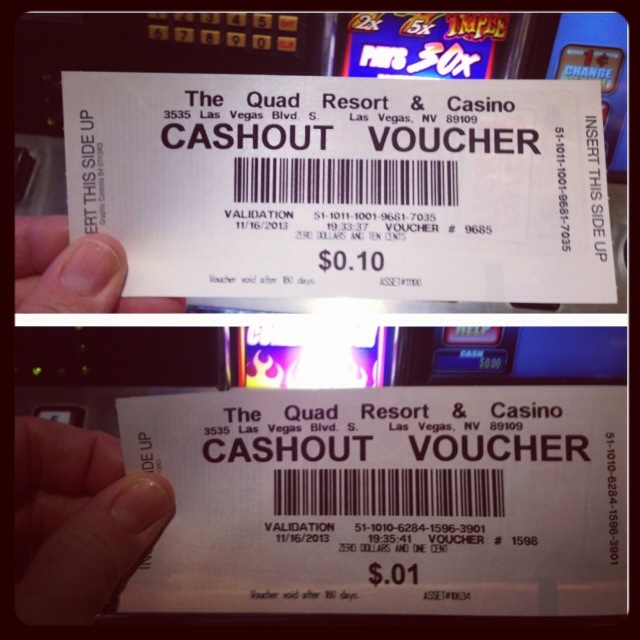 Fifteen years ago I put a quarter in a slot machine and I got it back out. I felt good about breaking even. Now the slot machines don’t accept quarters. They accept dollars and cards. I decided I’d allow myself to blow $20. I thought it’d last longer than 7 minutes and 14 seconds. I was with my friend Jen (who I knew in college and was the ONLY person willing to do the half marathon with me. Shocking.) and Cody who Jen knew and lives in Vegas now and must always live there so whenever I go there I have someone to hang out with. But he also needs to learn to gamble better. 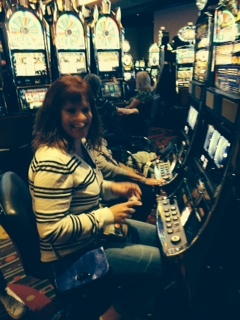 We found a penny slot and I thought I’d put a dollar in and play 100 times. But I only played twice and I was down to 10 cents. You can play more than one line at a time and I picked 6 lines. (I have no idea what any of this means. 2 buttons were lit up and I hit one.) And then I hit another button that was lit up. And then I lost. So I took my 10 cent print out and put it in another machine and lost 9 cents. I kept the paper. I figure it’s worth more than it’s worth. We noticed a man in a motorized chair who was on oxygen and smoking playing the slots across from us. So not only were we gambling my money away, we could’ve blown up at any moment. It was truly exciting. Then we tried to find a $5 black jack table. But I guess they don’t have $5 black jack tables on Saturday nights. (AND if you ask, people look at you funny.) So instead we found an empty $10 table and asked Phil the dealer to teach us how to play Black Jack. Phil is from Florida and actually conducts music but the job fell through in Vegas so he went to dealer school. We found out that casinos take in about $25 million a week. But that just doesn’t seem right. I think Phil felt bad we lost. He got black jack both hands we played. Then we left and went to Cody’s boyfriend Andrew’s show: Divas! I can’t explain how fun that show is. You just have to experience it. Vegas was the perfect trip. We partied hard on Saturday and then died slowly on Sunday. And true to most Vegas’ stories, I gambled more than I’d promised myself. I gave myself a $20 limit and I lost $20.99. It’s like I lied to myself. So I bought myself new shoes so I’d feel better. And I did. For some reason, when packing for Vegas, I went for middle class, stay at home mom look. NO ONE ELSE THERE DID. So I feel good about my choice.